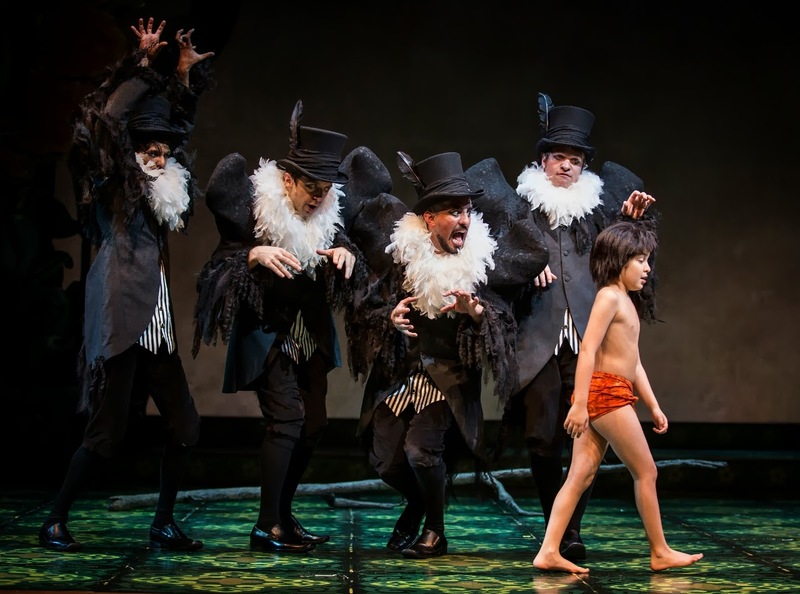 The new stage adaptation of Disney’s The Jungle Book – presumably bound for Broadway sometime in the future – has been launched at Boston’s Huntington Theatre, which has had a successful relationship with its high-profile director, Mary Zimmerman. (She directed Candide there two years ago as well as two previous productions.) Boston is lucky: the show is spirited, musically exuberant and gorgeous to look at, and children should adore it. As Disney’s 1967 animated feature did, Zimmerman’s adaptation takes considerable liberties with Rudyard Kipling’s stories, which were first published in 1893-94, but the narrative is essentially the same: a pack of wolves adopts a white baby and raises him to become a hybrid – part “man cub,” part jungle creature. Kipling focuses on the boy Mowgli’s coming of age, which prompts a crisis of identity – the wolves don’t want him any longer and he receives a cool reception when he returns to the village where he was born. Zimmerman’s book moves Mowgli back to civilization but deals only superficially with the subject of his mixed heritage. What it borrows from Kipling are the boy’s adventures in the jungle – climaxing in his encounter with the three-legged tiger, Shere Khan (Larry Yando), who has been stalking him since he was a baby – and his friendship with his protector, Bagheera the panther (Usman Ally) and the easygoing Baloo the bear (Kevin Carolan). The musical has a tepid book which never manages to make its child hero (played alternately by Roni Akurati and Akash Chopra) appealing: Mowgli spends almost the entire second act whining because Bagheera and eventually Baloo are promoting the idea that he’d be better off growing up among other humans. And though as a director Zimmerman is justly famous for her eye, the play goes flat every time two or three actors are on stage exchanging dialogue, and the comedy tends to be forced, sometimes painfully so. Directing actors isn’t one of Zimmerman’s gifts, and so the acting in The Jungle Book is erratic. Even some of the better performers – Ally, Yando, Carolan and Thomas Derrah (always a welcome sight) as the cobra Kaa – have trouble negotiating some of the scrappy scenes she’s written for them. Fortunately the singing and dancing are consistently delightful. And at the center of the show is the great André De Shields, who plays both Akela, the aging lone wolf, and, tossing a regal headdress of dreadlocks, King Louie, monarch of the monkeys. That’s the role Louis Armstrong voiced in the movie, and briefly but memorably De Shields even channels Satchmo. The jungle in this show is Indian, and Zimmerman and her designers, Daniel Ostling, Mara Blumenfeld and T.J. Gerckens, make the most of the setting. Ostling’s set is a series of pastel-colored cardboard-cut-out drops that shift constantly, both vertically and horizontally. A swing embroidered with cushions stands in for all the trees inhabited by animals, and every now and then a gilded cage flies down, containing perhaps a musician in Indian dress, perhaps a visiting god. Musicians make frequent appearances in the midst of the action, playing brass or drums on the elephants’ march – the elephants are employed wittily as suggestions of the English Army in Kiping’s colonial India – or perhaps sitar or Carnatic violin; Doug Peck, who orchestrated (superbly), underscores the Indian sounds and includes a wide range of eastern and western instruments. (The orchestra, a dozen musicians led by conductor Rick Hammett, is fantastic.) A sublimely silly sun with the face of a bejeweled Indian shines over the second-act opening; Blumenfeld has outfitted three twirling butterflies in a variation on traditional Indian garb, and one of them, Alka Nayyar, doubles as a doe who dances kathak. All of these touches are utterly charming. There are other entrancing visuals, too, like the marionettes fashioned from what look like tissue-paper blossoms that give fire (known to the terrified jungle creatures as “the red flower”) an almost human form, and the blue-confetti water drops. When Baloo makes his second-act entrance with a beehive under his arm, bees on strings swirl around it like the parts of a mobile. The addenda to the score includes one misstep, Shere Khan’s “Your Unexpected Friend,” which brings the second act to a standstill. It’s not Yando’s fault; self-defining villain songs almost never work in musicals (think of “Those Were the Good Old Days” from Damn Yankees), perhaps partly because for some reason they always seem to show up in the middle of the second act, when the last thing an audience wants is a solo from the bad guy. But I wouldn’t trade a single one of the dances, or the barbershop quartet by the vultures, “That’s What Friends Are For,” which also showcases my favorites among all of Blumenfeld’s marvelous costumes: the vultures are top-hatted, their necks wrapped in white boas, and under wings that look like ominous black humps they wear half-tuxes over disheveled black-and-white-striped shirts. Both visually and musically, this Jungle Book offers much to revel in. 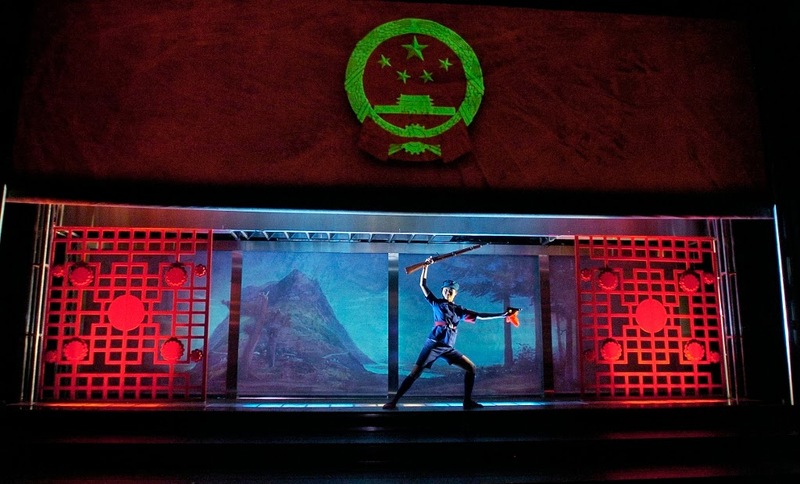 The much-sought-after Québecois director Robert Lepage brought The Blue Dragon to this year’s Next Wave Festival at the Brooklyn Academy of Music. Written by Lepage and Marie Michaud, who also make up two-thirds of the cast, performed in French with supertitles and set in China, it’s a kind of étude on the subjects of abandoned and reclaimed children and – a variation on that theme – abandoned and reclaimed artistic talent. Lepage plays Pierre, an émigré Quebecer who trained as an artist but gave it up to open a gallery in Shanghai. There his protégé and girl friend, a young woman named Xiao Ling (Tai Wei Foo) whom he met when she was working as a tattoo artist (she’s responsible for the dragon inked on his back), is about to open an exhibition of her work, forceful paintings based on highly emotional photographs of herself. Michaud plays Claire, Pierre’s best friend and sometime lover, who stops in to see him when she arrives in China to pick up the daughter she has just arranged to adopt. For reasons we don’t learn right away, the adoption falls through. Meanwhile Xiao Ling discovers she’s pregnant, though she isn’t sure who the father is – she has another boy friend Pierre may or may not know about – and she doesn’t think she wants to keep the baby. Pierre’s relationship with his own difficult father is messy and unresolved; they’ve had no contact for years, but now his father is dying and wants Pierre to come home to Quebec City. All three of the actors perform well, though Tai Wei Foo (who also dances) is less comfortable with the style – naturally – than Michaud and Lepage. She has the most affecting scene, though. There’s a break of a year in the action in the middle of the second act: Claire, who has returned to Montreal, comes back to China on business (once an artist herself, she chose to make her life in advertising) and looks in on Xiao Ling, who has walked away from her burgeoning career as an artist and is working in a shop in Shenzhen copying Van Goghs for customers. Her reunion with Claire ends in an eruption that inspires the actress’s most effective physical work. At one point Xiao Ling tells Claire a story about a young woman who gives birth to a baby and sets it afloat on a river, abandoning it to the fates. There are, Xiao Ling explains, three possible outcomes: the baby will drown, or be carried to a new home and family, or circle back to its mother. The Blue Dragon finds a way to dramatize the fable; Lepage and Michaud even provide three possible endings to the tale of Pierre, Claire and Xiao Ling. This is a minor work, perhaps, but I found it very satisfying.